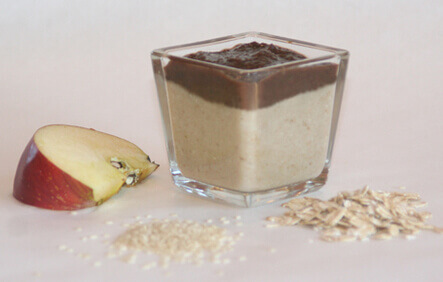 Layers of goodness make apples and spice and everything nice a tasty baby food the whole family will enjoy. This baby food will teach your child how to love healthy flavors from a young age — and you’ll enjoy eating this dish as a family for years to come. Pour the boiling water over raisins. Let stand for 5 minutes. Drain the water from the raisins and set aside. Grind oats in blender. Set aside. Toast the sunflower and sesame seeds in a dry pan. Add the apples to the seeds and sauté until soft – about 3 minutes over medium heat – stirring constantly. Blend this mixture to a puree. Stir the water from the raisins into the oat powder. Stir in apple mixture and cinnamon. Puree raisins in a blender. Serve the warm apple, oat, cinnamon mixture on the bottom topped with the raisin puree on top.